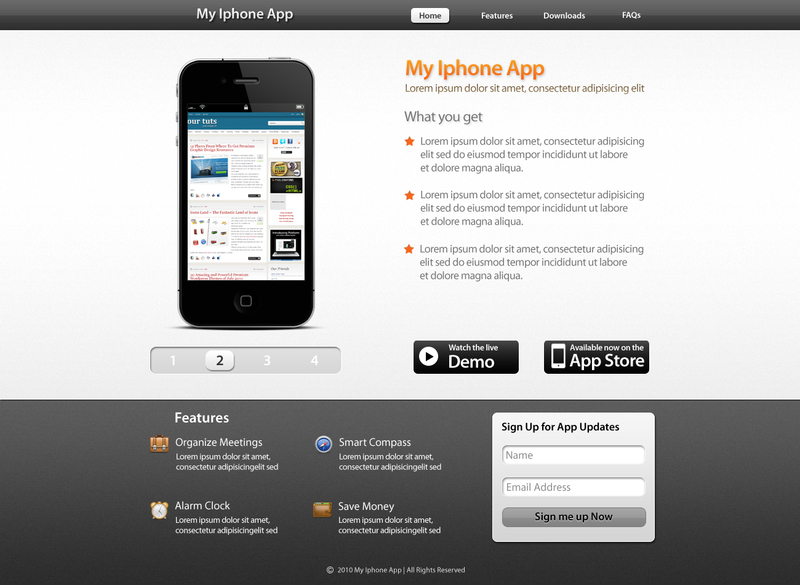 This tutorial will guide you trough the steps of a complete and beautiful layout of an Iphone App. Along the way,we`ll learn how to create nice effects inspired by Iphone and Apple,we`ll play a bit with some blending options and we`ll integrate some custom graphics which will beautify the layout. Also, we’ll take advantage of a few fundamental tools in Photoshop such as Rectangle Tool, Shape Tool and Marquee Tool. Okay! First step is to set up the workspace.Open Photoshop (For your help, I`m using Adobe Photoshop CS5) and create a new canvas of 1300×950 px. The layout will be 840px wide.Now, draw 2 vertical guides at 230px and 1070px to delimit the layout,like in the image. I`m going to add a gradient to the background and after, I`ll add some noise to it to make it rough. We can`t add noise to the layer because it has blending options applied.We should have a stand alone layer to do that.Create a new layer and merge it with the first layer.Now we have a stand alone layer which supports the noise effect and which has the gradient incorporated. Now, under the top-bar add a white horizontal line of 1px to create a deeper effect between the header and the background. Over the header bar, draw another rectangle with the height of 25px and the width of 1300px also and make sure to be white.Change its opacity to 7-10% to obtain an Apple Iphone transparency effect! In the right side of the top-bar, we`ll add the navigation menu.Add some text buttons.As shown in the image below, I draw a white rectangle using the Rounded Rectangle Tool with a Radius of 5px and made the “Home” text black.Then I added some blending options to the button to make it look good.The font used is Myriad Pro, Semibold, 14px. On the left side of the header, add a logo using some text…I used some dummy text: My Iphone App. I used Myriad Pro as font and added the same blending options which the button has. So far, the image looks good. I`m going to add a brand new Iphone 4G from our friends from DeviantArt. Search for “Iphone 4 PSD” and you should have a list there.If you want the link, click here. I added some text on the right side of the canvas using Myriad Pro font and different fonts and colors. Ok, this is a nice step.I`m gonna show you how to create a beautiful navigation like in the fancy Iphone Apps. Select the Rounded Rectangle Tool and draw a rectangle with a Radius of 7px under the Iphone. You noticed that the number “2” is black.Is a reason for that.This will be the active button. Step number 7 is about creating 2 buttons which every Iphone App Website needs: The “Buy this app from Apple” and “Live Demo of the app”. Select the Rounded Rectangle Tool (U) and with a Radius of 7px, draw a small rectangle under the text. Download this Iphone small icon from IconFinder, make it white and add it to the button. Then write inside the button with Myriad Pro font “Available now on the Apple Store” ! The button is ready to be clicked! Duplicate this button and align the duplicated one near to the original.Change the text with “View a Live Demo” or something like this and create a small “Play” button using the Custom Shape Tool(U). Select the Rectangle tool and draw a big rectangle at the bottom of the canvas.Add it the same gradient used at the “Apple Store” button. At the top of the footer draw 2 lines:a white line and a black line and but the white line just above the white line to create a nice effect. Now that the footer background is ready, I want to show you how to create an Apple inspired “Subscribe” box. Duplicate the field obtained and move it under the first like in the image. The button is almost ready. I wanted to add to the button a shine effect.For this, I selected the layer(Ctrl+Click on the layer) and with the Rectangular Marquee Tool(M) I subtracted the bottom half of the selection.Then I created a new layer and filled the remaining selection with white.After that, I reduced the opacity to 10% and obtained a nice glass effect for the button.Is the same procedure used at the header background. Finally, add some text to finish the box. The result looks nice,don`t you think? Now with some text, populate the left side of the footer. I thought to make this by creating a “Features” area, with the features of the app.The small icons used are from the PixeloPhilia Icon Set, a beautiful set of free icons. Don`t forget to add your copyright details at the bottom of the layer. yes I agree, the title should be ” ‘How to create an attractive iPhone App landing page’” cause when you say iPhone app layout , you are talking about layout of an app in iphone. but it turns out you were making a Web PSD mockup. Thank’s for this tutorial ! its nicely done. clear and perfect. actually i thought its a layout for iphone version when reading the title. This S**t screams AWESOME!! Way to go dude! Thanks! Good article! As for me, I make apps using snappii dot com. I already knew how to design apps on Photoshop but never like this, this technique is more easy than what I use. Thanks for providing a clear and practical guide.